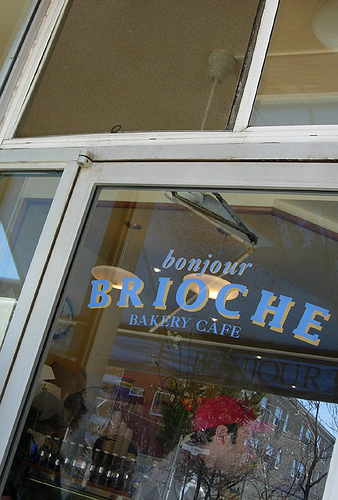 Then I went to Bonjour Brioche. It looked unassuming enough: “baked french toast with fruit and maple syrup.” I’d have overlooked it completely if a coworker hadn’t happened to mention that he’d had it and then proceeded to explain – in abundant detail – its delicious properties. “But you have to be the mood for something sweet,” he warned. I vacillated between the toast and the Croque Madam, but eventually decided to follow my sweet tooth. I was not led astray. Two giant, well, slabs of chocolate- and cinnamon-infused brioche arrived at the table, the streusel on top held to the top crust of the loaf with what can only be assumed was pure, liquid sugar. I love syrup and generally tend to drown the pancake/waffle/french toast I’m eating. This time, I tried to drizzle as opposed do drench and I’m glad I did. With one bite into that warm, scrumptious, intensely sweet brioche I was in Sugar Heaven. The tiny swirls of chocolate melted and oozed out forkful after forkful. A slightly tart bite of the fruit on the side cut through the intense sweetness of the french toast and then it’d be right back to the main event. I finished those massive slices of french toast with what can only be described as a vengeance. Those suckers were going down! My brunchmates, who went for the very yummy quiche Lorraine, were not offered bites…though I didn’t feel too badly as they opted for a chocolate croissant and a clafoutis, respectively. Having had dessert for my main meal, I just had some coffee.